Nitro, Chris and I had a blast at our local dog festival called Woofstock here in Roanoke Virginia this past weekend. Our friends Waynette and Elliot from Sponsor Hounds hosted a great Woofstock this year and our website deafdogsrock.com was honored to be part of their line-up. We hosted a "Dog Celebrity" tent so folks could meet Larry and Harley Groah the Biker Dog, Kickin, Zoe and Kristin of Dogs Rock Blog and Nitro of Deaf Dogs Rock blog. We had a blast and saw a lot of our rescue friends and got to hang out with some of Nitro's best buddies from the Salem Rotary Dog Park. We also had Evan a beautiful 9 month old deaf white boxer mix puppy from the RVSPCA to let folks know that deaf puppy Evan was available for adoption. 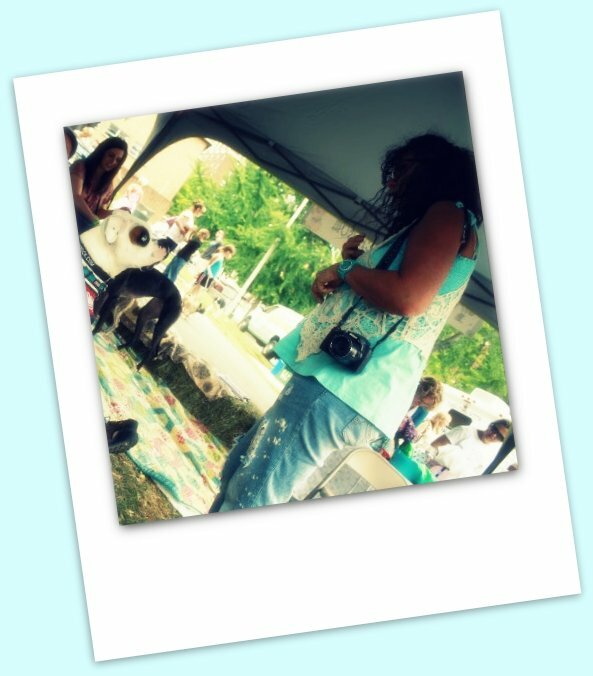 Here are some photos from our time at Woofstock. We hope you enjoy them as much as we did. Here is our DeafDogsRock.com tent at Woofstock. The weather was perfect at 72 degrees. It was wonderful having my sweet husband Chris there because he hung out with our deaf dog Nitro which freed me up to talk to people and educate them about how wonderful deaf dogs can be. 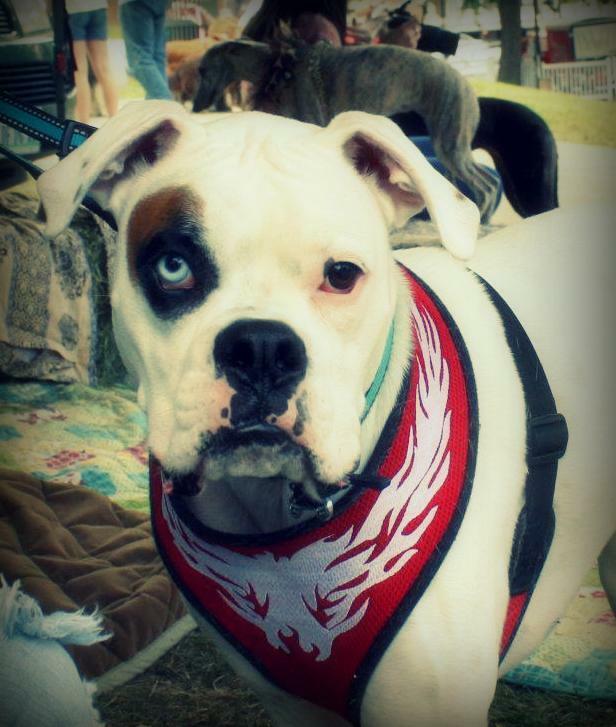 Our purpose for setting up at Woofstock was to promote our website where we offer deaf dogs up for adoption, deaf dog training tips and resources. We also wanted to introduce them to our deaf dog Nitro so they can see how wonderful a deaf dog is and can be. We also really wanted to highlight local dog celebrities because these are the folks on the front line when it comes to rescue and getting the word out via social media when it comes to getting help with transport and rescues. (Photo: L to R) Our friend Cheri and her husband Brian with their two boxer boys Ozzy and Loki, Larry and Harley the Biker Dog and Karen with Evan from the RVSPCA. Karen was a huge help with Evan. She volunteered to look after and keep Evan entertained for us so the general public could meet him. Karen also entered Evan in the Costume contest and won second place with Evan wearing a Deaf Dogs Rock T-Shirt! This is our friend Ashley with her beautiful sweet dog Juno. Ashley helps us often with volunteering to foster deaf puppies through Angels of Assisi Roanoke when we are in need. She and Juno totally ROCK! Nitro and his Daddy meeting new dogs at the Deaf Dogs Rock tent. He and his daddy had so much fun! Nitro was such a patient and good boy. He would even sit down every time a child entered the tent without being told to do so. I was a proud Moma! Cherri, Karen and Brian entertaining the three Boxketeers! Larry and Harley the Biker Dog hanging out with our friend Karen and deaf puppy Evan. Isn't Harley the cutest and coolest little dude you have ever seen? Check out our friend Charlotte with Larry and Harley the Biker Dog. Thanks Charlotte for coming by and hanging out with us. Charlotte took lots of great photos and she always shares them with us. You Rock Charlotte. This photo was taken by one of Charlotte's friends. Such a great photo! I was very fortunate to get this shot. This is Wendy's dog Tallulah Jane. When I went up to say hi to Tallulah Jane in my high pitched doggy voice she flashed me her million dollar smile just as I clicked the button. This is one of my favorite photos of all times. Good girl Tallulah Jane! Look at these two adorable little Divas. They didn't even have to walk at Woofstock because their moma pushed them everywhere in their doggy carriage. This is handsome Ozzy one of Nitro's best buddies in the whole wide world! This was me signing to Nitro and he is very focused on me in this shot (which means I probably had a treat in my hand). This is sweet funny Evan. Evan is a 9 month old deaf boxer mix puppy and by far one of the smartest pups I have ever met. I was signing to him and he figured the signs out at record speed. So much so that when I went back to the RVSPCA on Thursday to work with him he remembered all of the signs we worked on at Woofstock on Saturday. Scary smart dog! I hope Evan gets adopted this week. There have been several people who have sent me messages asking about him this week.Paws crossed! With the weather being so perfect at 72 degrees and a light breeze it seemed like everyone in town was at Woofstock with their dogs in tow. Graeme Anderson (Waynette's husband) working at the Woofstock T-Shirt tent. 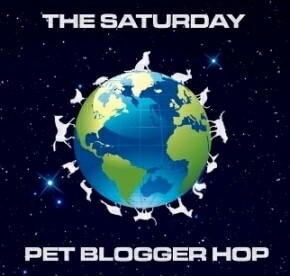 Kickin and Zoe of Dogs Rock Blog were hanging out with the hounds. See....I told you Evan is a cutie pie! The dog on the left looks like one of Kickin's siblings (Kickin is on the right). Zoe is so photogenic. She reminds me a a beautiful little doe laying in the woods. Zoe looks amazing with a little leopard print added on top of her brindle coat. We've missed seeing Kristin with Dogs Rock Blog this year so we were just thrilled when she said she could join us with Kickin and Zoe for the day. Thanks Kristin! According to my deaf dog Nitro and I, you, Kickin and Zoe totally ROCK! Kristin, Kickin and Zoe of Dogs Rock Blog getting their photo taken in front of the new graphics on our Deaf Dogs Rock transport vehicle. The Sign Factory here in Roanoke, VA did a great job making our transport vehicle into a billboard on wheels. 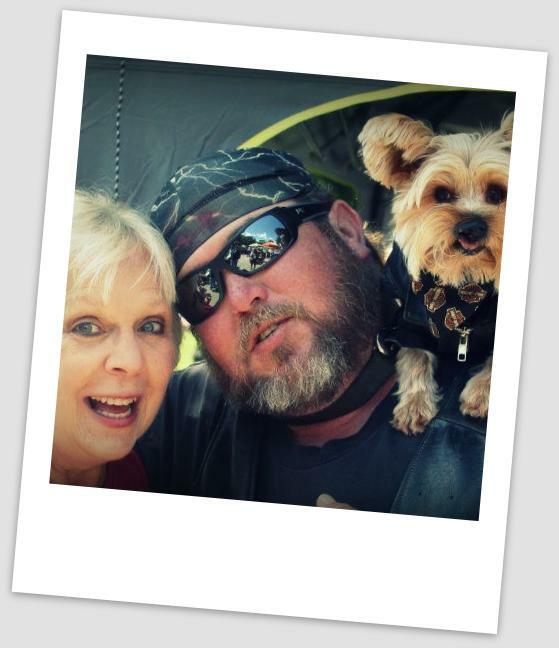 A big shout out to Larry Groah and his Biker Dog Harley Groah for driving all the way to Roanoke from Waynesboro, VA to be our celebrities at our Celebrity Dog Tent. Larry and Harley totally ROCK! This is one great looking "pack of hounds" if I do say so myself. I love this photo with Kickin's ears up and Zoe's ears down. This Chinese Crested dog was one of my favorite little Rockers at Woofstock this year. Here is a photo of Larry, Harley the Biker Dog, Kristin Guffey of Dogs Rock Blog, Waynette with Sponsor Hounds and I. I love this photo! We all look so happy and we were! Ashley and Juno relaxing just before they take the stage for the Woofstock Costume Contest. Kickin getting some attention from Sarah over at the Star City Greyhound tent. Elliot with Sponsor Hounds hosting the Dobson Pest Control Costume Contest. Karen with Evan. Evan was Rocking the Deaf Dogs Rock T-shirt. So much so, he placed second in the competition! The lady who had the Pugs and Frenchies in the costume contest did a great job making her dog's costumes. They came in first place. Karen and Evan Rocking the Deaf Dogs Rock Doggy T-shirt! Have you ever seen a blue Standard Poodle or in this case a Turquoise Poodle? This is Gwenavear. Isn't she just beautiful? I love her nails! This photo cracks me up because he looks totally wasted.